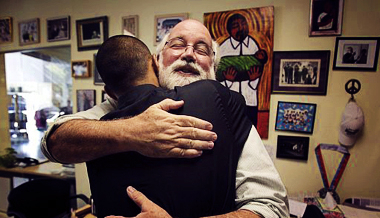 Father Gregory Boyle was born in Los Angeles and is one of eight children. He entered the Society of Jesus (Jesuits) in 1972 and was ordained a priest in 1984. He received his BA in English from Gonzaga University, an MA in English from Loyola Marymount University and advanced theology degrees from The Weston School of Theology and the Jesuit School of Theology at Berkeley. He has taught at Loyola High School in Los Angeles; was chaplain in the Islas Marias Penal Colony in Mexico and at Folsom prison and worked with Christian Base Communities in Cochabamba, Bolivia. He was appointed pastor of Dolores Mission Church in the Boyle Heights neighborhood of Los Angeles in 1986 where he served through 1992. Homeboy Industries was born in 1988 and is now the largest gang intervention, re-hab and re-entry program in the United States. Father Greg is the author of the New York Times Bestselling book, “Tattoos on the Heart: The Power of Boundless Compassion.” His debut book has been honored by SCIBA (Southern California Indie Booksellers Association), Pen USA, Publishers Weekly, and Goodreads Choice Awards. He has received numerous honorary degrees, awards and recognitions including the Civic Medal of Honor, the California Peace Prize, Humanitarian of the Year from Bon Appetit Magazine, and in 2011 was inducted into the California Hall of Fame. He has served on the State Commission for Juvenile Justice and Delinquency Prevention, The National Youth Gang Center Board and the Attorney General’s Defending Childhood Task Force. Father Greg Boyle on standing it the lonely place. Father Greg Boyle on ripping off roofs to be with those outside.